Creating a Permission Manifesto for Happiness! Who decides whether or not we are happy? Who decides whether or not we feel at peace with ourselves? Who decides whether or not we see ourselves as successful contributors in this world? We are each responsible for our own happiness, peace of mind and success. It is when we refuse to take responsibility for our happiness, peace of mind and success, we suffer emotionally, physically and spiritually. Most people, rather than take responsibility for their life, choose to blame. They blame other people and circumstances for their unhappiness, stress and so-called failures. Let’s face it: it’s easier to point fingers than it is to take responsibility for where we are today and where we’d like to be tomorrow. The truth is that life happens. It is part of the human experience. It’s what we all signed up for. The challenge most of us face is that we are trained and conditioned to focus on what’s wrong with our lives rather than what could be. As children, we hear adults whining and complaining about how bad things are, what’s wrong with other people and how life is one struggle after another. Bad attitudes and negative mindsets are contagious. The good news, however, is good attitudes and positive mindsets are contagious, too. There is only one thing we each have to “do” to change our attitude and mindset: create what we call a “Permission Manifesto.” A manifesto is a declaration. When we declare anything, we put it into motion and our lives begin to change. You see, until we give ourselves permission to be happy, be at peace and experience success, they will all elude us. A permission manifesto is like your own personal decree; like your very own Declaration of Independence. And what are you declaring your independence from: feeling down, being stressed and anxious, the past with all of its’ regrets and resentments? A permission manifesto is a starting point where we all begin to live our lives on our own terms. It is where we give ourselves permission to develop the qualities within us that will allow us to shine, express our talents and gifts, and live our lives with greater zest and intensity. We have written on numerous occasions that “happiness is a decision” and that we are each one decision away from experiencing it. By giving yourself permission to experience happiness, inner peace and success, you will literally change your genetic makeup and DNA. Don’t take our word for it: scientists are now identifying this as verifiable fact. A permission manifesto will make you feel better, look better, do more with less effort and create an all-around positive energy field for you. Creating a permission manifesto is easy. All that is required is deciding how you want your life to be, how you want to feel most of the time and then allowing yourself to experience what it is you desire. These are just a few examples you can include in your personalized permission manifesto. We challenge you to create your own permission manifesto. Read it daily. Print it out and place it strategically around your home: on a bathroom mirror or the refrigerator door. Share your permission manifesto with a friend, a mentor or someone who is uplifting and encouraging. Share it with the two of us! We’d love to hear from you! Previous PostMake Happiness Your New AddictionNext PostAre You On-Course? When you asked the 3 questions in the beginning of the article it reminded me of the questions that are asked during a wedding ceremony. The answer to the questions are,” I do.” I remember being nervous on what was supposed to be the happiest day of my life. Making that commitment to someone else and expecting them to make me happy was one of the hardest lessons I needed to learn. After my divorce, I decided to make a committment to myself and my happiness. Giving myself permission to do this was the first step. Thank you, Jon and Chris for being there to guide and assist me through the process. Thanks Doreen for sharing your personal experience. The greatest gift we can give ourselves is to take responsibility for our own lives. When we do, we greatly increase the likelihood of sharing our lives with others in a healthy, mature and gratifying way. 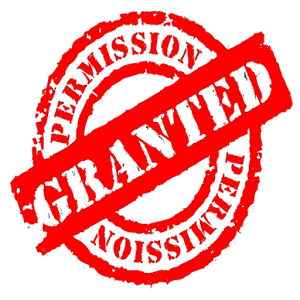 Another great idea…the permission manifesto…put it into action and I believe it will change one’s life! Two thumbs up!! !